Plans never survive contact with the project manager, or however the saying goes. Full disclaimer, the writer has a Prince 2 qualification. Yesterday afternoon we were stunned to receive a message that indicated whilst UCU and UUK had reached an agreement, it was one that had profoundly negative implications for members and for future industrial action. Late night discussions, both in branch, and nationally, showed a deep disquiet, and disbelief, in what was on offer. Essentially, UCU and UUK were proposing a pension deal similar to, but arguably worse, than the ‘offer’ rejected 3 years ago. In addition, the UCU leadership caused consternation for teaching staff members by promising they would reschedule lectures, that they would then be doing for free having already had pay deducted. Instead of meeting at 7:30, picketing was postponed, and an emergency all Member meeting was called for 10:00 with less than 12 hours notice. Nevertheless, over 120 members attended and gave excellent feedback, speaking forcefully and eloquently to the proposed deal. A presentation featuring some (by necessity, with only 18 hours between the offer being presented and the HEC vote taking place, hastily overnight researched and created) slides to illustrate the offer was presented by a member of the UCU committe (and uploaded here as per requests from members). 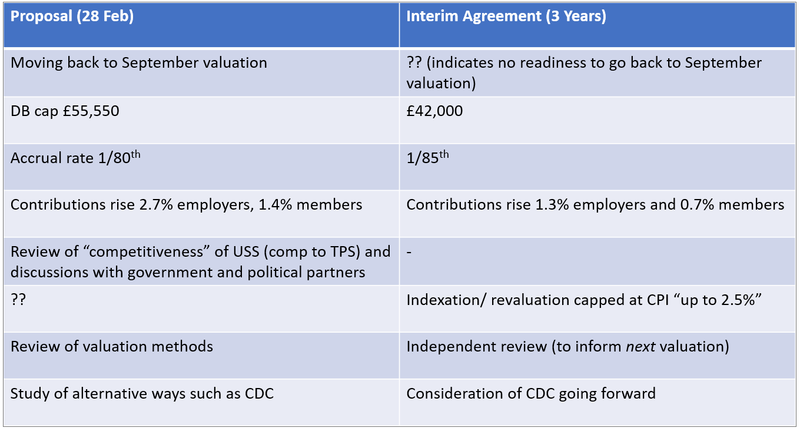 Slide 3 of the presentation contains a useful comparison of the existing and proposed deal. It was the opinion of many speakers that each and every line indicated a drop in pension value and were all similarly unacceptable red lines. 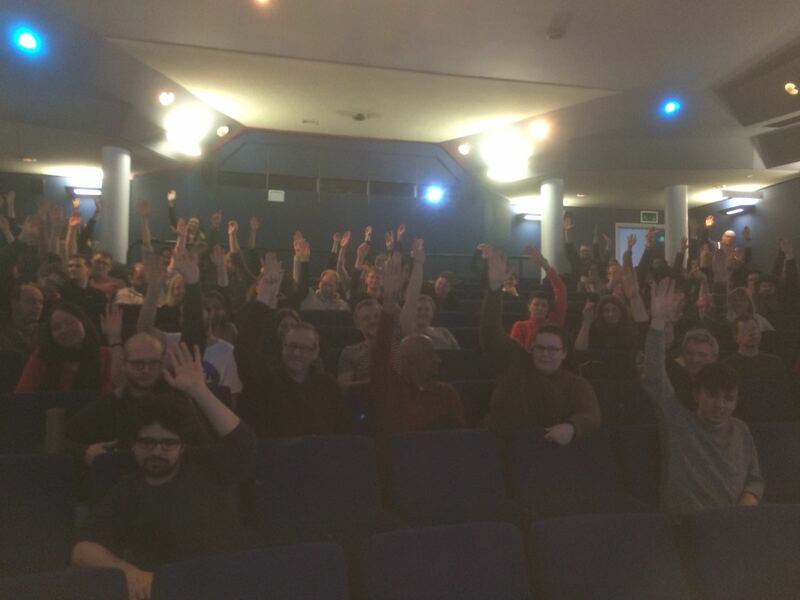 At the end a vote was taken, and 115 voted to reject the offer, with only 5 abstentions and this was communicated to our union rep and HEC rep in London. 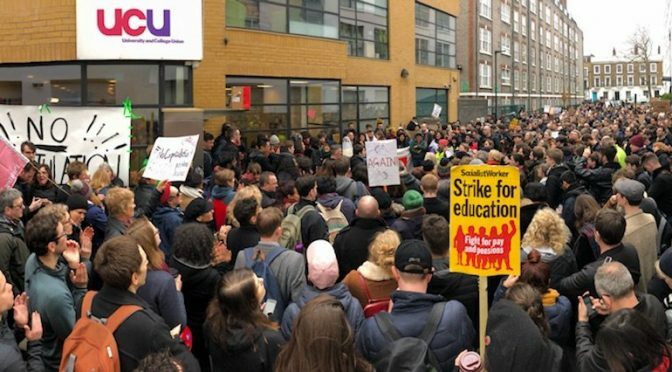 Scenes in London were astonishing, with 800 UCU members crammed into the street outside UCUs offices calling for the deal to be rejected. 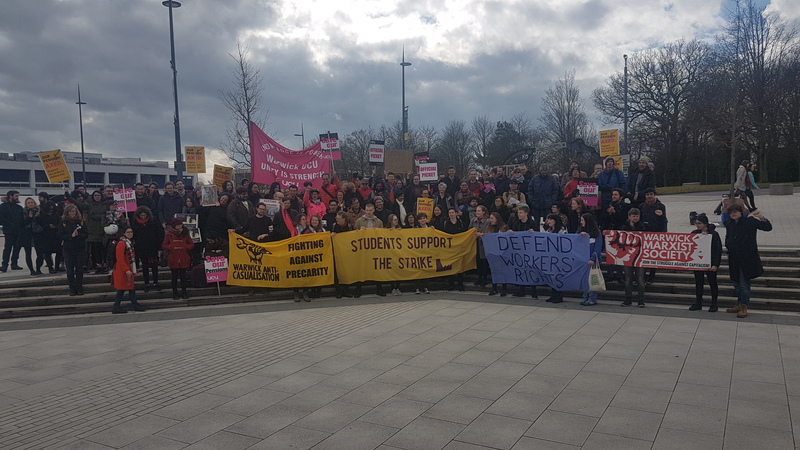 Meanwhile, at Warwick, we continued our picket in solidarity and wondering what the outcome of the HEC meeting would be. Reports were coming in of other branches voting to reject the offer, many unanimously. Their representatives voted accordingly. The HEC then voted and the deal on the table was rejected. Feedback from people present at the meeting clearly indicates how the vote was moved by the action of the members, and the very clear rejection that was sent from more than 40 emergency member meetings across the country. “The overwhelming view of branches was that while the proposal retained defined benefit it did so at too low a level (only the first £42,000 of salary) and that the proposed reduction in accrual rate was also unacceptable. Branches were also clear that the refusal of the employers to shift their position on taking more risk was disappointing.